Today the Designer Crafts Blog Connection Hop officially begins. The posts that you will be reading, for the first installment, will be mostly about what the designers who attended the Winter CHA show observed in the way of trends, designs, experiences and all things crafty. I was unable to attend the Winter show, but I have seen photos that many have posted and shared. It will be interesting to read more of what they have to tell us. Though I didn't attend, I still find ways to check out trends and new products. One is searching online for both trends and products. As I mentioned in the last post, blogs are a good way to keep up with new ideas. I also find it fun and interesting to just browse stores and malls. If you have stores in your area like Pottery Barn, Anthropologie, Crate & Barrel, visit them and be aware of colors, shapes and textures. Large department stores such as Macy's is also a good place to wonder around in too. Just checking out photos from CHA and shared photos from a gift show, I can see certain things repeated over and over. Flowers are everywhere, made from just about anything and decorating almost everything. It seems that "vintage" is still very popular in crafting and decorating. I get the feeling that holidays are a big deal and not just Christmas. Natural fabrics seem to be used in a variety of ways. Photos are framed, collaged and displayed in a variety of ways. I would call them "3D Memory" Displays. Jewelry is still big. It just seems to get more and more creative with all the wonderful products being manufactured. Plus I still see a move to use eco- friendly products and recyclable materials, that I really like. There is a fantastic give away to some lucky crafter who is hopping through the blogs. While you are reading them, keep your eye open for the little "cricut" cricket (that little guy in the upper left corner of the ad above). Nine logos were randomly placed on several of the blogs. Take note of which blogs you found it on and keep a list. Once you have read them, please go to Julie McGuffee's blog: Life in the Craft Lane. You need to leave a comment and the names of the nine blogs the "cricut" logo was found on. The winner will be named on March 13th when the designers will be sharing a variety of Wedding ideas with everyone. 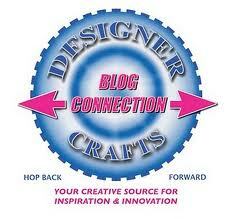 If anyone is unfamiliar with how to navigate the blogs, you will find the "Designer Crafts Connection" button at the top right in the sidebar of my blog. You can move forward or back to each participant. On some of the blogs you may have to look a bit further down in their sidebars for the button. Thanks for the trend tips! Looking forward to hopping along with you!